We love this: UK Starbucks locations will stock diaper kits to help new moms out when they're in a pinch. Patiently waiting for the US to follow suit! 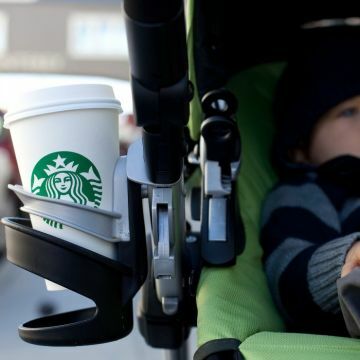 Starbucks locations in the UK are doing something to make life easier for their baby-toting customers—they're stocking emergency diapers kits for frazzled on-to-go parents. In addition to keeping emergency supplies of diapers on hand, UK stores will also train baristas to safely warm baby bottles and help mothers find places to nurse their babies. They'll also help families find open tables and high chairs—essentially, the stores will cater to mothers and do what needs to be done in order to make their lives a bit more manageable. "Essentially, our employees are trained to help parents, whatever their need," Starbucks spokeswoman Linda Mills said, according to Business Insider. "It's a fantastic program." The program is a partnership with the UK's National Childbirth Trust and has already launched. There's no word from Mills on whether we can expect to see this happen at American Starbucks locations, but can we just say that we would really, really like to? Starbucks employees at 800 locations were trained to identify the needs of new mothers before the program launched—when they see a mom struggling with a stroller or high chair, they're expected to provide assistance immediately. Baristas are also encouraged to remind families that they can pay for their drinks without approaching the counter if they use the Starbucks app—they've also been told that they should deliver orders to a family's table so parents don't have to stand in line with their kids. "We want all of our customers to have a good experience at Starbucks and we recognize that parents out on their own with very young children, sometimes for the first time, appreciate some support," Rhys Iley, vice president of operations for Starbucks EMEA, said. "Many struggle with unwanted attention and comments on their feeding method whether it's by breast, bottle or in a high chair, when out and about with their baby or child," Sarah McMullen, head of research of the National Childbirth Trust, added. "It's important that parents feel reassured they have the support of staff and won't be judged."